I’m still thinking about his exit at Yankee Stadium earlier this week. Who didn’t get emotional seeing that? For such a great, classy professional, this was the most perfect sendoff for him. And to see Mariano Rivera cry also, shows how much he cares about the game and is appreciative for everything we’ve given him. Even though I despise the Yankees, there was always an exception to a few players on the team that I did like. Hideki Matsui was one that I felt didn’t fit in with the “Evil Empire” identity of the team. Derek Jeter was also another one I admired and respected — especially after that flip to Posada to tag Jeremy Giambi. But Mariano Rivera was the one I could not hate. As it has been documented over the years, and a lot more this week, Rivera was the perfect baseball player. He took advantage of an opportunity, excelled at something nobody else could do and ended up on the top. On the way up to the top, he didn’t look down at the people below. Instead, he brought them up with him. Whether it was teaching them how to throw the cutter or just encouraging them, Rivera was the kind of player that baseball needed. He gave us, the baseball world, a gem to hold onto. This exit from Yankee Stadium was perfect for a man that was the perfect player and teammate. Can’t embed, so click the above image. Having Metallica perform “Enter Sandman” live for Rivera’s retirement ceremony was great. After the song, the entire team greeted Rivera and Rivera gave a heartfelt speech and got a standing ovation. This was great for one of the greatest players ever. What a show! This was well done. Very well done. 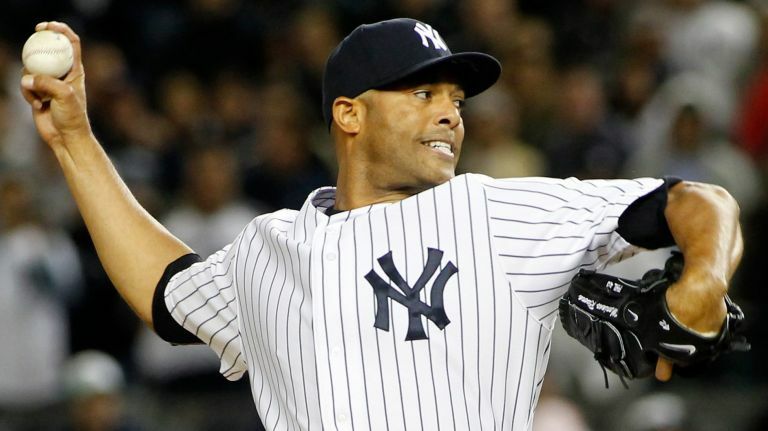 Should Metallica play ‘Enter Sandman’ live for Mariano Rivera in his last home game? I wonder how they would do it if it actually came to be. They probably have to have a stage set up before the game and just hope that the Yankees have a save situation to bring him in. People wonder how it would be for a band to play a song live during an event. Look no further than to wrestling where it has been done before. I give you Triple H coming out to his own theme song performed by Motorhead. If Rivera came out to a live performance by Metallica, imagine the intimidation factor. I for one am for it. I’ve been lucky enough to see Mariano Rivera pitch before. It was special. But with this being his last season, I had to go see him one last time. I drove two hours down to San Diego to see him play. And this was my first time at Petco Park. The park itself was beautiful. And when the 8th inning approached, everyone started to crowd this one stairway that was above the bullpen. Security tried to clear the way for people, but it was just too hard. The entire series featured about 50-50 split in Yankees and Padres fans. And on Saturday when Rivera came in, the entire stadium was cheering for him. It was an awesome experience to see him pitch. There was just an aura off something special there. I just can’t put it into words. Great memories at this ballpark. Did Jim Leyland make right call by having Mariano Rivera pitch the 8th inning? Mariano Rivera salutes the crowd. Mariano Rivera had a great show at the All-Star Game. He had a 1-2-3 inning in his final All-Star Game appearance. He won the Game MVP and the crowd gave him a tremendous standing ovation when he entered and exited the game. It was beautiful. The only thing different about this than what he’s been doing most of his career is that this happened all the in the eighth inning. The best closer in the history of the game did not close the game. He came in to set up Joe Nathan in the ninth. Manager Jim Leyland had to have had a good reason for this, right? Normally in any situation, Rivera would pitch the final inning to get the save. The situation, however to Leyland was a little different. Entering the eighth inning, the American League was up 2-0 and Leyland must have thought that the National League might have a chance to take the lead at the bottom of the inning, thus eliminating the save situation. Rivera was told to warm up.